1" Leather Suspenders made from Top Grain, Edge dyed Leather. X-back design with Genuine Leather crosspatch on the Top side and a Vinyl inside patch, used to prevent leather dye from staining clothes. Under the Leather crosspatch we use fully elasticized back straps to provide greater comfort. The suspenders are paired with Nickel Finish Drop Clips and Slide adjusters MADE FROM 100% Plated Steel. 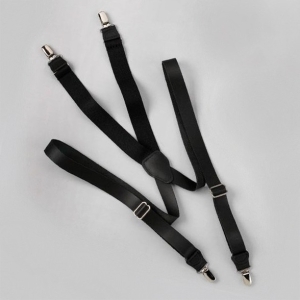 These 48" length suspenders can be made smaller by using the length adjusters.